Guide to sync iCloud photos to Dropbox. 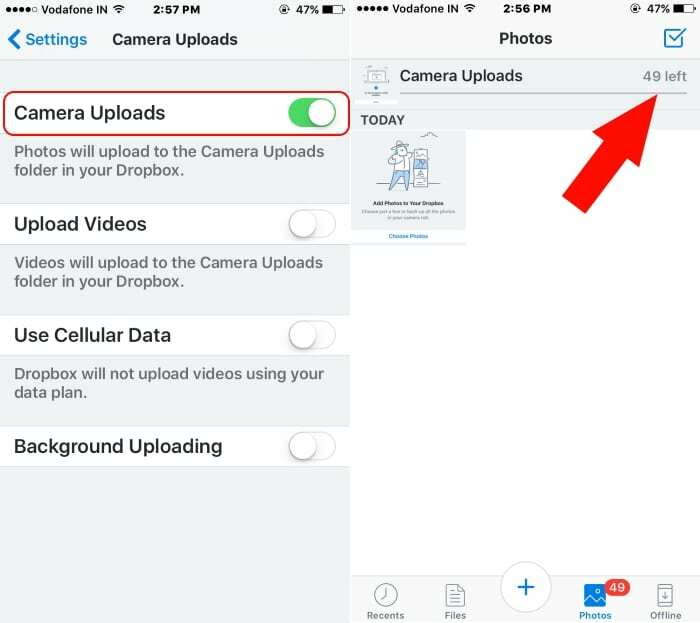 Get perfect Solution on keeping your iCloud Photo or camera photo app to your Dropbox account. Nevertheless, an iCloud drive is not a bad option for taking full device backup easily, but the person who has already Dropbox and using from many years they have the best options for Move iCloud photo to Dropbox from iPhone/ iPad. With this help we can enjoy other tens of beneficial benefits like MS Office integration, 256 AES Encryption, Easily access on Mac/ Windows, File recovery and history manage, Remotely wipe data. Dropbox has standard plans for personal, Business or Enterprise use. And the perfect solution to manage any file type that you want. In the whole process, you should have a full copy of the iCloud photo on the iOS device locally. 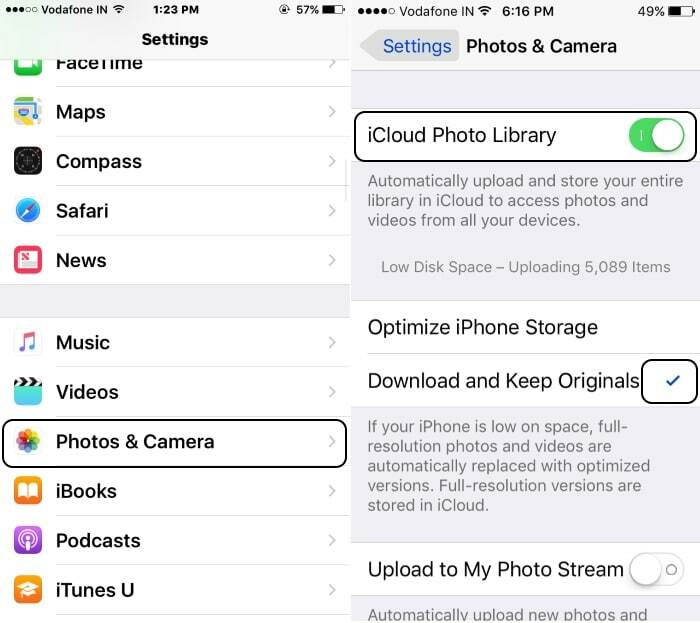 To enable iCloud Photo sharing on iOS settings app. Then upload all pictures to Dropbox. 2: Next, Tap on Photos or Photos & Camera option. In latest iOS – Tap on Photos Setting. 3: Then, Enable iCloud Photo Library toggle. Options panel you will also find after enabling library. You should check mark Download and Keep Originals photos and Video in settings. Open photos app on iPhone/ iPad. Check all photos will be downloaded there. Dropbox is a convincing application for keep back up your all photos from iPhone/ iPad using manually or Automatic backup. Then easily access on all platform and devices. 2: Login with your Dropbox username and Password. Skip steps for taking backup of selected photos. 3: Tap on “Recents” option from tab below. Next, Tap on Settings gear icon frop top left corner of the screen. 4: Under Settings, Tap on Camera Uploads > Enable Camera Upload toggle. More customization on auto upload settings you have below options. Upload Video: With Photo, Upload Big size video on dropbox as well. Use Cellular Data: Disable it, Big save and be safe from data plan penalties. 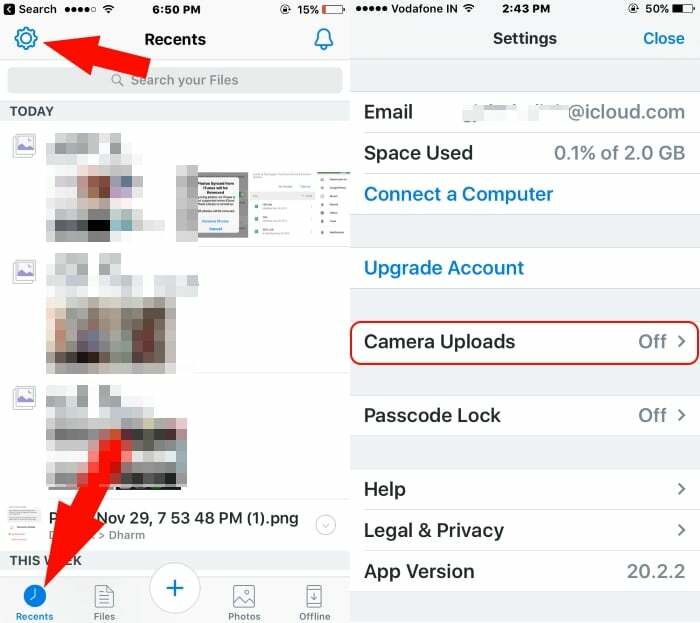 Background Uploading: Enable and Leave it for auto uploads all photos app data to Dropbox automatically when you are in the network. Enjoy all iCloud photos, Videos by Move iCloud photo to Dropbox automatically from iPhone/ iPad.